The researchers can look into the past like this because of the time it takes light to travel large, cosmic distances. Light quickly fills a room when a lamp turns on, but the light from faraway galaxies can take billions of years to reach the eyes of an observer standing on Earth. So, the objects or events someone sees through a telescope may have actually happened eons ago. Telescopes, therefore, can act as time machines for scientists. The Subaru observatory, on Hawaii's Mauna Kea. In two new studies, the team of astronomers peered back in time to 16 different epochs between 11 billion and 13 billion years ago. They found light coming from galaxies that existed when the universe was only 7 percent to 20 percent of its current age, the statement said. To pinpoint these ages, the researchers looked at universal expansion. In general, scientists use the expansion of the universe to determine from which epoch, or from how long ago, light originates. As the universe expands, the light traveling from any one of these 4,000 galaxies gets stretched on its journey to Earth. This caused the wavelength of the light to become redder, a phenomenon known as redshift. Because the redshift is tied to how far away a galaxy is, researchers can use filters to measure particular wavelengths of light and then deduce how far back in time the light is coming from. This is a map of the cube of space-time covered in the new survey by David Sobral of Lancaster University and the research team. It shows the "look-back time" to the galaxies in billions of years. The circles mark the positions of the 4,000 galaxies from the study. The colors represent the degree of redshift seen. Bluer circles indicate galaxies seen in the more recent past (less redshifted). Green, yellow, orange and red circles indicate successively higher redshifts; they are galaxies that are located progressively further back in time. "Some of these galaxies should have evolved to become like our own, and thus we are seeing what our galaxy may have looked like 11 [billion] to 13 billion years ago," researcher Ana Paulino-Afonso, a Ph.D. student in Lancaster and Lisbon, Portugal and co-author on the study, said in the statement. 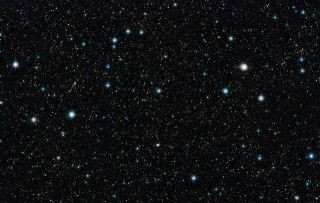 "The bulk of the distant galaxies we found are only about 3,000 light-years across in size, while our Milky Way is about 30 times larger," Paulino-Afonso added. "Their compactness likely explains many of their exciting physical properties that were common in the early universe." The work was announced today (April 4) at the European Week of Astronomy and Space Science conference in Liverpool, England. The team also published their findings in two papers in the journal Monthly Notices of the Royal Astronomical Society.